Goggles on, moustaches waxed and chocks away! 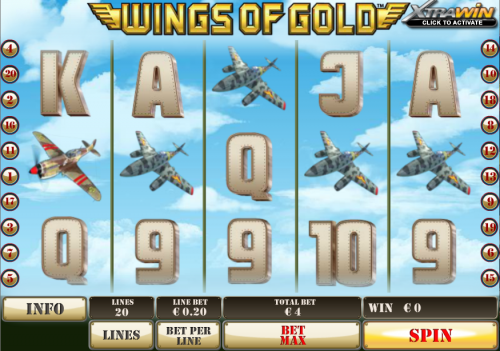 Wings Of Gold from Playtech brings the excitement and glamour of World War 2 flying to the slot machine. In truth of course it was an appallingly dangerous time for those brave enough to take to the skies but this slot concentrates on the lighter side of life in the air. Wings Of Gold is a five reel and twenty payline game set against the backdrop of clouds dotted around a blue sky; Playtech’s low value playing card symbols have a metallic, riveted look about them but the higher values are represented by three different types of fighter aircraft, a glamourous female flyer, a moustachioed pilot and a Wings Of Gold logo. The pilot is the wild symbol and the logo is the scatter. Playtech’s Xtrawin feature can be activated by clicking the Xtrawin button in the top right hand corner of the screen and this will cost you an extra 50% of your current stake. What you’ll get in return is a gold background and an expanding wild rather than the standard wild symbol. When the pilot appears he’ll cover all the reels and you’ll get a nice animation of a plane in flight. This is the main bonus game and it’s triggered by landing three or more Wings Of Gold logos anywhere on the reels; you’ll now be taken to a screen containing three medals. Pick one and some special reels will start spinning; the number of times your medal appears on those reels indicate the number of free spins you will be awarded. You can win anywhere between five and one hundred free spins at this stage and clearly the more the better; during the free games phase you’ll get the expanding wild whether Xtrawin is activated or not. More free spins can be won indefinitely by landing three more scatter symbols. Playtech’s slots can be a little bit plainer than some others but their playability is never in doubt. The Xtrawin feature is a nice extra touch and the bonus game can be extremely profitable if you’re lucky enough to win loads of free spins.